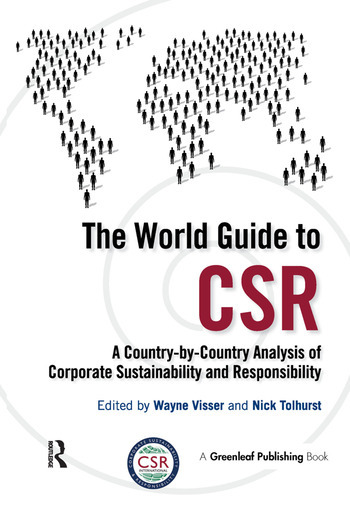 The World Guide to CSR is the first book to provide comparable national profiles that describe the evolution and practice of Corporate Sustainability and Responsibility (CSR) for 58 countries and 5 global regions. Each regional and national profile includes key information about the relevant CSR history, country-specific issues, trends, research and leading organizations. The purpose of the book is to give CSR professionals (including managers, consultants, academics and NGOs focusing on the social, environmental and ethical responsibilities of business) a quick reference guide to CSR in different regional and national contexts. The need for the book is premised on the fact that CSR professionals and researchers more often than not have a multinational remit and are required to benchmark performance internationally, but find that country-specific CSR information is ad hoc, limited or non-existent. Even where national CSR research exists, it is often hidden in academic journals that practitioners cannot access or do not have the time or inclination to read. The book is an edited volume, with expert contributors from around the world, all of whom have been screened and selected on the basis of their qualifications and experience in CSR. Each regional/country profile includes the following subsections:CSR in context Priority issues Trends Legislation and codes Organizations Case studies Educational institutions References This unique resource will be an essential acquisition for all organisations who need to benchmark their CSR strategies throughout different regions and cultures and want the best possible intelligence on the key issues and concerns relating to corporate social responsibility in all of the markets in which they operate.